Nicholas J. Cull: Professor of Public Diplomacy & founding director of the Master of Public Diplomacy program at USC. I'm a researcher and teacher. I started out as a historian specializing in the role of communication in international affairs. It was a quiet backwater until the centrality of the media in contemporary global politics (and 9/11) turned the field into a priority for governments and other international actors. For the past ten years I have run a master’s degree program at USC preparing aspiring diplomats to reach out to foreign publics; I lecture all over the world and have worked with a number of governments and international actors on issues of public outreach, international image and diplomatic training. I’ve especially enjoyed working with Mexico, with colleagues in China and with the State Department’s Foreign Service Institute, which is an unsung gem within the Federal Government. My recent clients include the Japan Foundation (cultural diplomacy arm of the Japanese government), the Internet Corporation on Assigned Names and Numbers and an outfit called the Legatum Institute in London, which is seeking to understand how communication can best support and sustain transitions to democracy. Our Public Diplomacy master’s program here at USC is considered the best in the world. My part in that success is -- I hope -- to provide an animating vision and through my own teaching to keep the program focused on the best approach to public diplomacy, which I believe must begin with listening to the foreign public. Everything I do has flowed from my research: that means thirty years or so in the archives and interviewing and observing practitioners to build my own sense of what public diplomacy has been and what it needs to be for the future. At a certain point the government officials began calling me to find out what had happened historically rather than the other way round. I believe my program is the best because we are able to attract the best students from around the world. They are highly skilled (often multi-lingual) and highly motivated to see what can be done to promote international understanding. One of the great pleasures of running the USC public diplomacy program is to be able to introduce the students to one another and watch the partnerships and networks take shape. I can only stay on top if I keep up my own research work so that my teaching can be informed by distilled experience from the field. My program can only stay on top if we can continue to recruit students of the highest caliber. I’m glad that we now have a one year version of my program to permit serving mid-career diplomats to take a concentrated version of the degree. 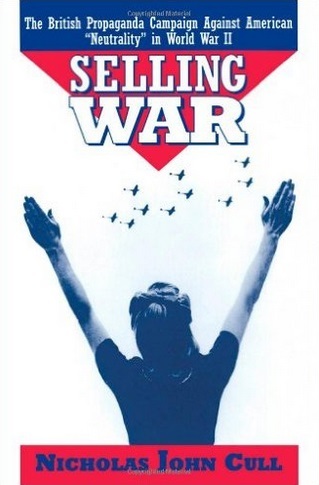 If success -- like beauty -- is in the eye of the beholder then my greatest research success was my first book -- Selling War -- a study of the ways in which the UK government used propaganda to draw the US into World War Two before Pearl Harbor. It was such a great subject and I was so lucky to be able to speak so many participants in the campaign before they passed from the scene. As for our program, our USC public diplomacy team collectively won the State Department's Benjamin Franklin award a few years ago now. It was wonderful to have that collective recognition. Personal: I want to be the best Dad and husband that I can be. Business: I'd love to write a book that both does academic justice to my field and is of interest to the general public. One subject I'm planning to explore is the problem creating propaganda for peace and not just against war. My most challenging moment was not related to my career, but was the birth of my middle son in 2004, who unexpectedly has Down Syndrome. I was lucky to have spent time with kids with Down Syndrome when I was a teenager and knew from that experience that it wasn't the end of the world, but it was a shock for sure. Seeing the world through his eyes is a gift and an important check on the messages I get from my academic environment that intellectual attainment is the only measure of a person. I am fascinated by the process of communication and the ways in which humans are susceptible to persuasion in all its forms. I remain intrigued by propaganda films and by the sensation as they tug on my emotions. I know I'm not immune to spin, which actually is a surprisingly common illusion. Gandhi: "Be the change you would see in the world." Much as I admire my colleagues in public diplomacy in this country and around the world, and my students past and present, my family comes first. I am lucky to have a wonderful wife and three terrific sons currently aged 5, 10 and 12. Despite loving my current home in Southern California with the beach and the Santa Monica mountains, I am still very attached to the South of England where I grew up and especially the Dorset coast where my family originated. Maybe there is such a thing as ancestral memory. 500 years in one place must do something to a family. Probably Lonely Planet guide books. I think they have just the right mix of history and local recommendations. I make a point of buying one for each of my international trips. I am researching a book on the role of communication and campaigning in bringing the end of Apartheid in South African and love getting over to that amazing country and interviewing the veterans of that spectacular campaign.